Chapter XXIX: What is Certainty? The Chinese cannot help thinking that the Octave has five notes. The more necessary anything appears to my mind, the more certain it is that I only assert a limitation. I slept with Faith, and found a corpse in my arms on awaking; I drank and danced all night with Doubt, and found her a virgin in the morning. I wouldn't start to argue with the Chinese, if I were you; they might remind you that you exude the stench peculiar to corpses. Doubt even if thou doubtest all. It seems sometimes as if beneath all conscious doubt there lay some deepest certainty. O kill it! slay the snake! The horn of the Doubt-Goat be exalted! Dive deeper, ever deeper, into the Abyss of Mind, until thou unearth that fox THAT. On, hounds! Yoicks! Tally-ho! Bring THAT to bay! Once more—what a book that is: I never realized it until now! it says—see that double page at the onset, one with “?” and the other with “!” alone upon the blank. Moreover you should read the long essay The Soldier and the Hunchback: ! and? in the first volume and number of The Equinox. Clear enough, the difference between 1 and 2: ask me the time, I say half-past two; and that's true enough. But the Astronomer Royal is by no manner of means satisfied with any approximation of that kind. He wants it accurate. He must know the longitude to a second; he must have decided what method of measuring time is to be used; he must make corrections for this and for that; and he must have attached an (arbitrary) interpretation to the system; the whole question of Relativity pops up. And, even so, he will enter a caveat about every single ganglion in the gossamer of his calculations. * It seems natural to me—apodeictic after a fashion—to treat Doubt as positive, even aggressive. There is none of the wavering, wobbling, woebegone wail of the weary and bewildered wage-slave; it is a triumphant challenge, disagreement for its own sake. Irish! Browing painted a quite perfect picture of my Doubt. Excuse me just a moment! When I was staying at the Consulate of Tengyueh, just inside the S.W. frontier of China, our one link with England, Home, and Beauty was the Telegraph Service from Pekin. One week it was silent, and we were anxious for news, our last bit of information having been that there was rioting in Shanghai, seventeen Sikh policemen killed. For all we knew the whole country might rise en masse at any moment to expel the “Foreign Devils.” At last the welcome messenger trotted across from the city in the twilight with a whole sheaf of telegrams. Alas, save for the date of dispatch, the wording in each one was identical: each told us that it was noon in Pekin! They had to be relayed at Yung Chang, and both the operators had taken ten days off to smoke opium, sensible fellows! 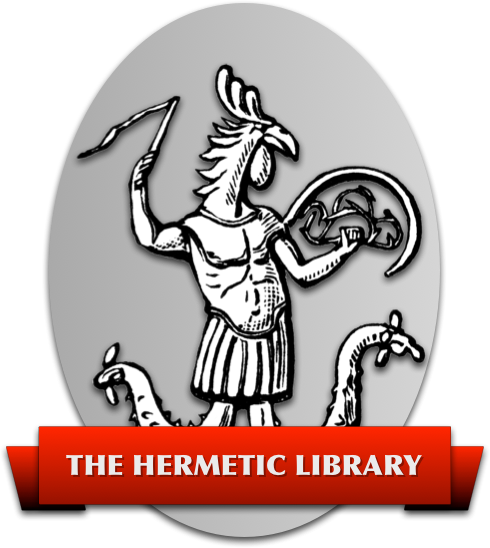 But Hermes Trismegistus is not content with any such fugues as the Astronomer, however cunning and colossal his Organ; his Third Degree demands much more than this. The Astronomer's estimate has puttied every tiniest crack, he concedes it, but then waves it brusquely away: all the time the door is standing wide open! What Hermes means by this it will be well to enquire. I think that Hermes was contemplating a Ruach closely knitted together and anchored by incessant Aspiration to the Supernal Triad; just such an one, in short, as appears in those remarks on the Magical Memory, a God-man ready to discard his well-worn Instrument for a new one, bought up to date with all the latest improvements (the movement of the Zeitgeist during his past incarnation, in particular) well wrought and ready for his use. This being so, a truth which is “of all Truth” should mean any proposition which forms an essential part of this Khu—this “Magical Identity” of a man. . . . . . . What's that noise? . . . . . . I think I hear Sir Ausbruch! And in full eruption too! And hasn't he the right? For all this time we've bluffed our way breezily ahead over the sparkling seas, oblivious of that very Chinese Chinese-puzzle that we started with, the paradox (is it?) of the Chinese Gamut. (We shan't get into doldrums; there's always the way out from “?” to “!” as with any and every intellectual problem whatsoever: it's the only way. Otherwise, of course, we get to A is A, A is not-A, not-A is not-A, not-A is A, as is inevitable). Very good, but what am I to do about it? Some at least of such certainties must surely be “of all Truth.” The test of admission to this class ought to be that, if one were to accept the contradictory of the proposition, the entire structure of the Mind would be knocked to pieces, as is not at all the case with the Astronomer's determination, which may turn out to be wrong for a dozen different reasons without anybody getting seriously wounded in his tenderest feelings. “Oh, don't gas away like this! I want to know what to do about it. Am I to accept this cauerwauling Gamut, and enlarge my Mind, and call it an Initiation? Or am I to nail my own of-all-Truth Tonic Solfa to the Mast, and go down into the Maelstrom of Insanity with colours flying? Do you really need Massed Bands to lull Baby to sleep? The Master of the Temple deals very simply and efficiently with problems of this kind. “The Mind” (says he) of this Party of the First Part, hereinafter referred to as Frater N (or whatever his 8° = 3° motto may be) is so constructed that the interval from C to C is most harmoniously divided into n notes; that of the Party of the Second Part hereinafter referred to as—not a Heretic, an Atheist, a Bolshie, a Die-hard, a Schismatic, an Anarchist, a Black Magician, a Friend of Aleister Crowley, or whatever may be the current term of abuse—Mr. A, Lord B, the Duke of C, Mrs. X, or whatever he or she may chance to be called—into five. The Structure called of-all-Truth in neither of us is affected in the least, any more than in the reading of a Thermometer with Fahrenheit on one side and Centigrade on the other. You naturally object that this answer is little better than an evasion, that it automatically pushes the Gamut question outside the Charmed of-all-Truth Circle. No, it doesn't really; for if you were able to put up a Projection of those two minds, there would be, firstly, some sort of compensation elsewhere than in the musical section; and secondly, some Truth of a yet higher order which is common to both. We may then with some confidence reaffirm that our certainties do assert our limitations; but this kind of limitation is not necessarily harmful, provided that we view the situation in its proper perspective, that we understand that membership of the of-all-Truth class does not (as one is apt to think at first sight) deepen the gulfs which separate mind from mind, but on the contrary put us in a position to ignore them. Our acts of “love under will,” which express our devotion to Nuit, which multiply the fulfillments of our possibilities, become continually more efficacious, and more closely bound up with our Formula of Initiation; and we progressively become aware of deeper and vaster Images of the of-all-Truth class, which reconcile, by including within themselves, all apparent antinomies. It is certain without error that I ought to go to bed. This schema is, as far as I can tell, derived from a loose translation of the first line (or rather, preamble), of the “Emerald Tablet” a “Hermetic” writing believed to be of Alchemical significance (the earliest known copies are in Arabic). It is more usually rendered along the lines of “True without error, certain and most true.” I do not know the origins of the “of All Truth” reading – T.S. A detective in sensational fiction of the period – T.S.